The HVAC industry is growing faster than ever. By 2023, the HVAC system market is expected to reach a value of $251.6 billion. So, what can you do to maximize your piece of this size-able pie? If you’re an HVAC business owner, you should start by developing a clear understanding of how to calculate profit margins and optimize your income. By taking steps to increase your profit margins now, you’re setting your business up for success as the market expands. This article looks at average HVAC profit margins, salaries, and expenses to help you decide how to set your prices and pay your technicians. We’ll also talk about simple changes you can make to optimize your profit margins. How Much Should You Charge for HVAC Services? This can be tricky to answer. People get squeamish when you bring up money. But the bottom line is, you’re running a business – and a business needs to be profitable to survive. That means you’ll need to think strategically about how much to markup materials and how much to charge per hour or per job. Before you can turn a profit, you need to charge enough to cover basic materials and labor costs. So, start by figuring out your break-even point. That is, what’s the absolute minimum amount you need to charge to cover your expenses? Once you have this baseline figure, you can use it to help set your rates and optimize your margins. Here’s how to calculate your break-even point for any HVAC job. Step 1: First, add up all of your monthly costs for running the business, including bills, rent, licensing, and equipment. Then, divide the total by the average number of jobs you do per month. Step 2: Next, estimate how many hours each job requires and multiply it by the hourly cost of your technicians and other staff members. This should include hourly wages as well as any additional benefits you offer, like health insurance. Step 3: Calculate the costs of all materials and equipment required to complete the job. Step 4: Add these numbers together to calculate your break-even point. If you were to charge a customer that exact amount, you’d recover all your expenses – but wouldn’t make a cent of profit. Now that you know your break-even point, you need to factor in your desired profit margin and markup costs accordingly. Many HVAC business owners treat profit margins and markup as the same thing, but these are two different numbers – and to make a healthy profit, you need to understand both. Markup is the difference between your break-even point (i.e. what you pay for parts and labor) vs. what you charge the customer. You need to know how much a part costs you before you decide how much to charge for it. Keep tabs on fluctuations in market prices to avoid short-changing yourself if costs go up. Standard markup on parts is 100% for non-retail items, which means you can bill the customer for twice what the part cost you. Labor markup ensures you’re making a profit off the time your technician spends completing a job, rather than just enough to pay their wages. Your profit margin is the percentage of sales that represent profit. That is, how much you’re earning back in relation to the total amount invoiced for. You can set your prices by using your desired profit margin or markup on individual costs. If you’re wondering how much to pay an HVAC technician, there are several factors to consider. According to a 2018 survey, the most critical factor that affects an HVAC professional’s salary is their level of education. 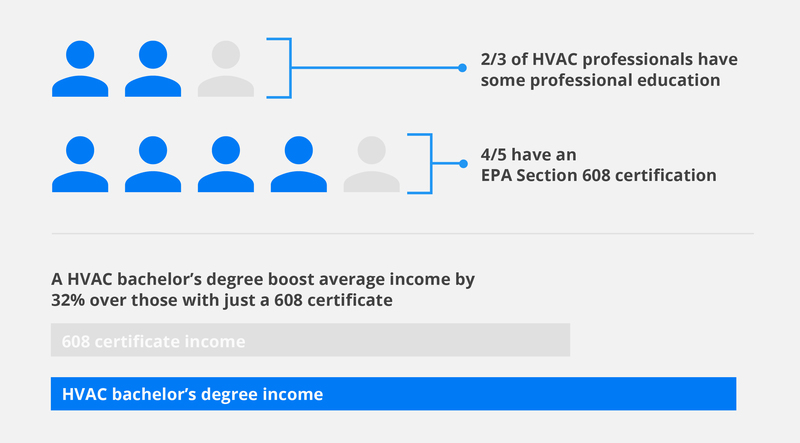 While the median income for all non-owner HVAC professionals is $55K, techs with certifications and degrees can command a higher salary. This makes sense, since the more a technician is able to specialize within your field, the more potential value they can bring to your company. Almost two-thirds (61%) of HVAC professionals have some form of industry-related education. Four out of five (80%) people surveyed have an EPA Section 608 certificate. Those with an undergraduate degree in HVAC-R make an average of 32% more than someone with just a Section 608. How Much Do HVAC Owners Make? Of the HVAC professionals surveyed, 12% were business owners. While technicians often assume their boss is taking home the majority of company profits, this is far from the truth. HVAC business owners have a much larger income range than their employees. Average owner income is $598K per year, but the median income for owners is only $76K. One owner surveyed claims to take home a hefty $20MM per year. These numbers suggest that a very small portion of HVAC business owners are making serious bank, but the median income for owners is only 21K higher than that of employees. Customer acquisition cost is the amount you have to spend on advertising and sales to get one new paying customer – and it’s often a significant cost that can eat into your profit margins. In fact, one report found that acquiring a single new customer costs HVAC professionals between $200 and $300. If you can minimize your acquisition costs, your profit margins will go up. Experiment with direct mail, email marketing, and social media marketing to get noticed by your target audience. Ask new customers how they found out about your business. When you find a type of advertising that works more effectively than others, shift more of your marketing budget towards those efforts. Even if you can cut down your cost per lead, it’s much more cost-effective to retain an existing customer than to acquire a new one. So, if you can sell more services to your established customer base, you’re automatically increasing your profit margins. One way to increase sales from current customers is to offer maintenance agreements that bring in recurring monthly revenue. You can also use direct mail and email marketing to keep your company top-of-mind for existing customers during slow months. This is effective because it not only fills up your schedule during the off-season, but it also frees you up to service new customers who are more likely to contact you during the busy season. There’s a time and a place for providing discounted services – for instance, during a serious lull in the off-season or to reward customers who give you referrals. However, most of the time, you should try to avoid lowering your rates – especially if you’re looking to boost your average HVAC profit margin. If you want to attract new customers without cutting into your profits, add more value to your existing offer. So, rather than promoting a 10% discount for first-time customers, focus on communicating added value instead. That could mean throwing in an added bonus that won’t cost you anything, like beefing up their warranty or priority service in the case of an emergency. Putting together an amazing team doesn’t mean only hiring seasoned pros. You can and should invest in fresh talent who can learn from your more experienced techs. Not only do junior technicians have lower salary requirements, but they’re also easier to mold into the perfect employee and are often eager to learn more about the industry. Your techs are the lifeblood of your company, so it’s worth investing in developing their skills. By encouraging team members to specialize and earn new certifications, you can inspire them to build a long-term career with your company. If you invest in your team today, you’re strengthening your business and setting yourself up for a more secure financial future. The first key to maximizing profits is to know exactly how much money you have coming in, how much is being spent, and how your costs break down. Using a home service business managing tool like Housecall Pro makes it easy to keep tabs on your cash flow, customers, invoices, and profit margins. Plus, you can accept credit card payments with our mobile app, which means you get paid before even leaving the job site. That means no more overdue invoices or time spent chasing customers for payment – which is great for your bottom line.